Aerial perspective is a phenomenon observable in nature, due to haze and other particles in the atmosphere. 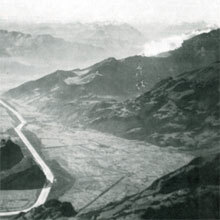 These particles place a grey-blue veil over the landscape, increasing in density with the distance from the observer. Aerial perspective disguises the mountains in the background. Rendered view without simulated aerial perspective. From Atlas of Switzerland. Colours of objects closer to the observer show a high contrast, whereas objects farther away appear lighter and with much less contrast. 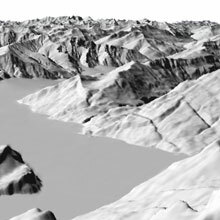 When used with shaded relief, aerial perspective serves to differentiate between high mountain summits and lower, more distant lowlands. When aerial perspective is applied, contrast gradually sharpens towards the highest peaks and softens towards the lowlands. The highest amounts of contrast depict the highest mountain peaks. Imhof’s map image “Walensee” uses aerial perspective in an ideal way.